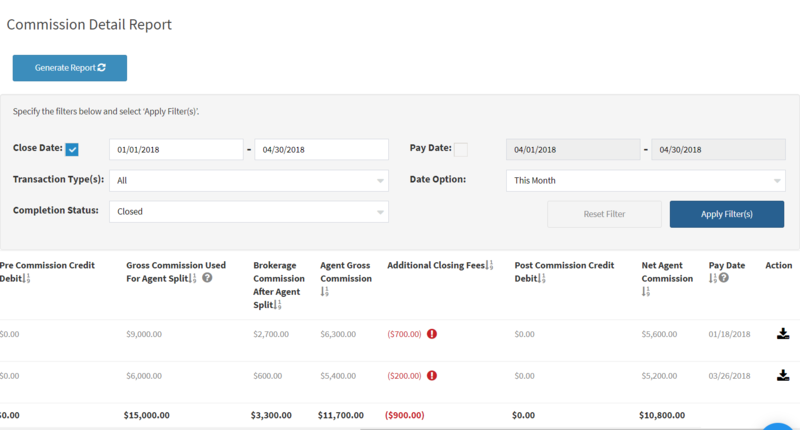 In your agent portal you will be able to see your commission breakdown for each transaction closed in the system, your sales volume, your direct deposits (if your Broker is paying via direct deposit), your billing log (if your Broker does agent billing), you can update your information, and pull reports for your transactions. Once you have created your password your dashboard page will have a summary of your closed transaction this month, your transactions closing this month and your sales volume this month. On your menu your will have access to your transactions, reports, office documents, your account information, settings and help. This will have a pipeline of all your transactions in the system including the address, close date, type and status, your name, the sale price, a lead source if you have added one and the completion status. 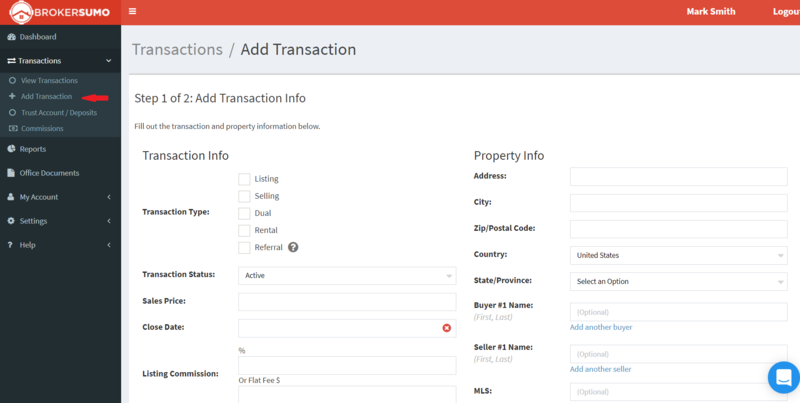 Add Transactions-if your Broker has given you access to add your own transaction you will be able to manually enter transaction in the system. Trust Accounts/deposits- This is a tracking log for any deposits you may be holding on a transaction. If your Broker has not given you access to add deposits you will be able to view the deposits. 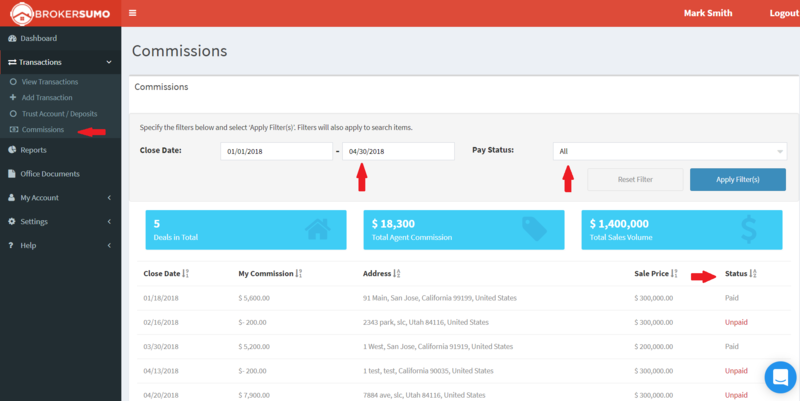 Commission Log- From here you can see your commission log for each transaction, the transaction information and status, whether it has been paid yet or not. You can filter this report by status and date ranges. Reports- The next section is the reports section, you can run reports for your transactions. Lead conversion report- If you track your lead sources this report will show how much you spent on each lead source, how many transactions you closed and commission earned from those lead sources and your cost per acquisition. Pipeline report- Shows all pending and closed transactions, and their current closing status giving you an overview of how many deals you've closed and what your pending commission pipeline looks like for the future. This report can be filtered by close date, lead source, completion status, transaction type and transaction status. If you have not created a disbursement on it and the status is 0% you can see your pending commission volume. Agent Billing report- This report is an overview of your billings, if your Broker charges monthly, quarterly, bi-annual or annual billing items. You can also see one-time charges that are not associated with a transaction. You can filter this report by billing date, this report will show you the status (paid or unpaid) and any outstanding balances you may have. Additional Closing Fees report- An itemized breakdown of all additional closing fees from your commission disbursements. 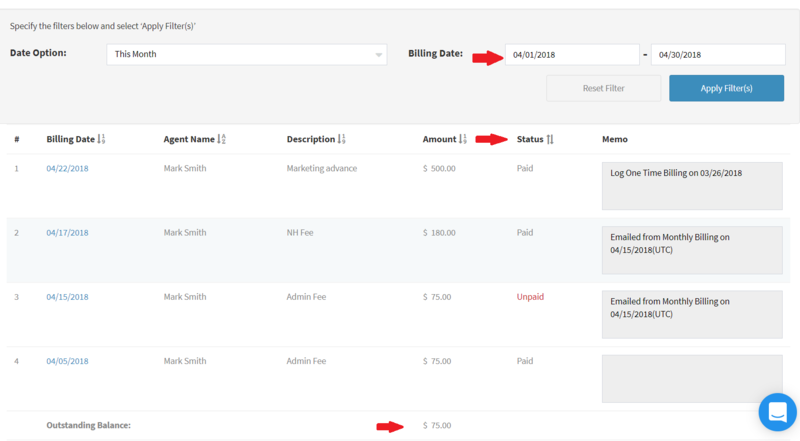 Here you can filter by date and see the address, what the fee was for, the amount and date. Commission Detail report- This report shows all closed deals, the gross and net commissions and all credits and debits and giving you insight into the total amount paid to the brokerage and total amount paid to you. This report can be filtered by close/pay date, transaction type and completion status. You can see all the transaction information and commission disbursement information, and download a copy of the disbursement. Cap Plan report- If you are on a cap commission plan you can see your cap amount, how much you have paid in towards your cap. Agent Monthly report- A month over month overview showing your sales totals breaking down your listings, selling, rentals and referrals. 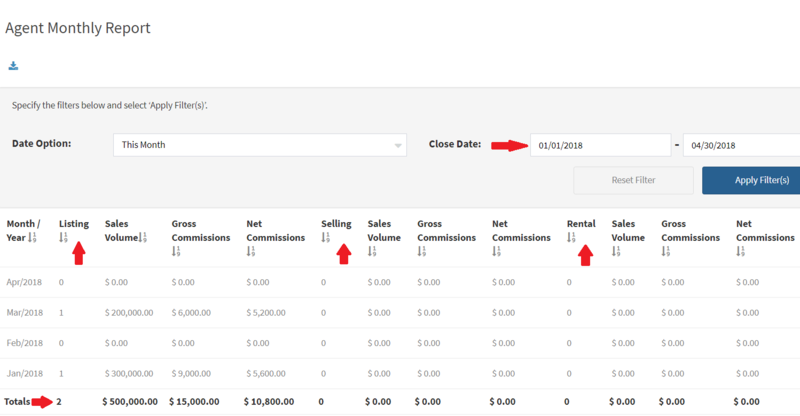 You can filter this report by close date, and your totals of each transaction type are listed at the bottom. Office Documents- These are any office documents that your Broker has added for you to have access to. My Account- This is all of your basic account information, your name, address, phone number, licensing information, birthday etc. Documents- This section has any documents you completed during on-boarding or any documents that your Broker has uploaded to your portal. 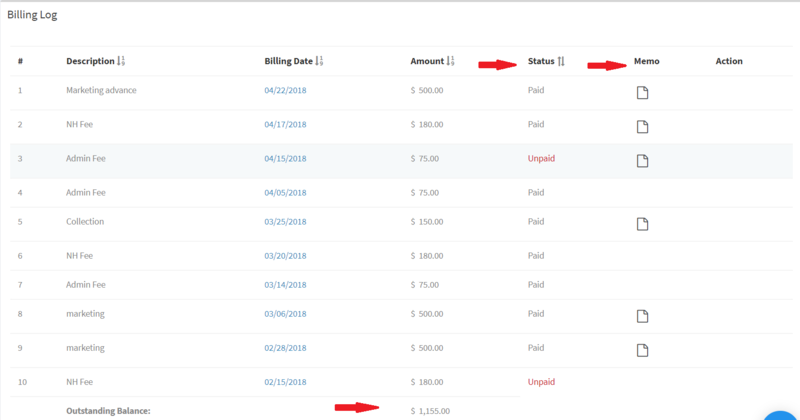 Billing Log- This has all billings that your Broker has billed your for, you can see the description of the item, the date it was billed, the amount, the status (paid or unpaid). If you click on the memo you can see additional information. Payment Log- This section is for any direct deposits you have received through the system. Other Income- This is a log of any payments to you that are not associated with a transactions. You can filter this log by date range. 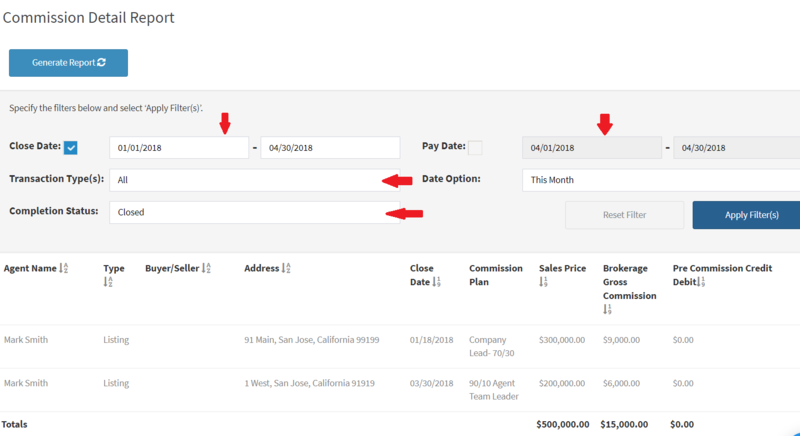 Settings- In this section you can set up your lead sources as tags, you can integrate with Dotloop (if applicable to your Brokerage) and set up vendors. Integrations- This would be used only if you need to sync your dotloop account to your BrokerSumo account. Vendors- You can use this section if you want to set up vendors that you may be paying out on a disbursement, for example a referral fee to an outside brokerage. Click Add Vendor and enter the information requested. Help- This section is useful to find information on features of the system. Here you can find videos, email for support and articles on each feature of the system.